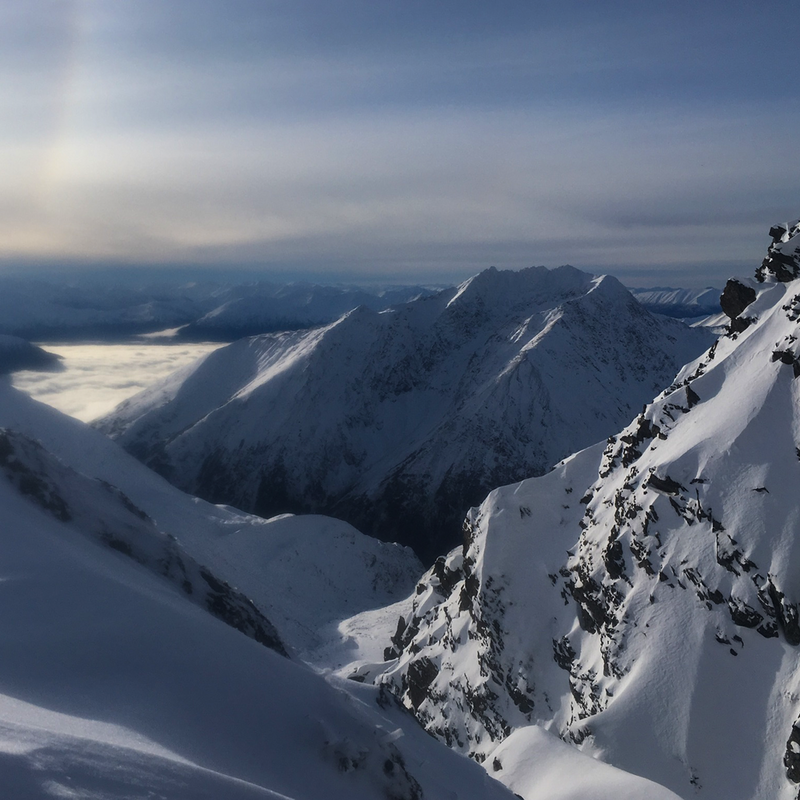 Alaska is famous for its amazing spring skiing with tons of snow and huge lines. But the early season skiing here is quite unique. Not many people get to experience genuine winter skiing in Alaska. The beginning of October starts off with over 11 hours between sunrise and sunset dramatically decreasing in December to 5 1/2 hours. The short days and low sun angle can complicate ski days. Many slopes have partial sun on them for just a small window of the day, and most aspects stay in the shade all day. The area is also prone to severe storms. It is not uncommon for storms to last weeks, making skiing quite difficult if not impossible. The past few years, seemingly endless storms have brought insane amounts of rain to the area, sometimes reaching the mountain peaks. Though the winter conditions can be harsh, when everything lines up, the early season skiing can be the best there is. Sam getting ready for a ridge walk yesterday at Turnagain Pass. From the tall peak, it is a 3000’ run to the valley floor (sorry I cut the top off, cell phone and cold hands). Notice the spine just short of the summit with 2 tracks. If you want it, you can be skiing on glaciers as soon as the first snow falls. Girdwood is located at sea level, but is surrounded by mountains that jet straight up from the ocean thousands of feet. This year, we started skiing in late September. For this early glacier skiing you have to be committed to the long approach. Backpacks are full of skis, ski boots, lunch and layers making them the heaviest daypacks a person could put together. After hours of hiking, you finally reach the snow line. Hiking boots are off and skis and skins are on. The first few turns of the season feel so good. 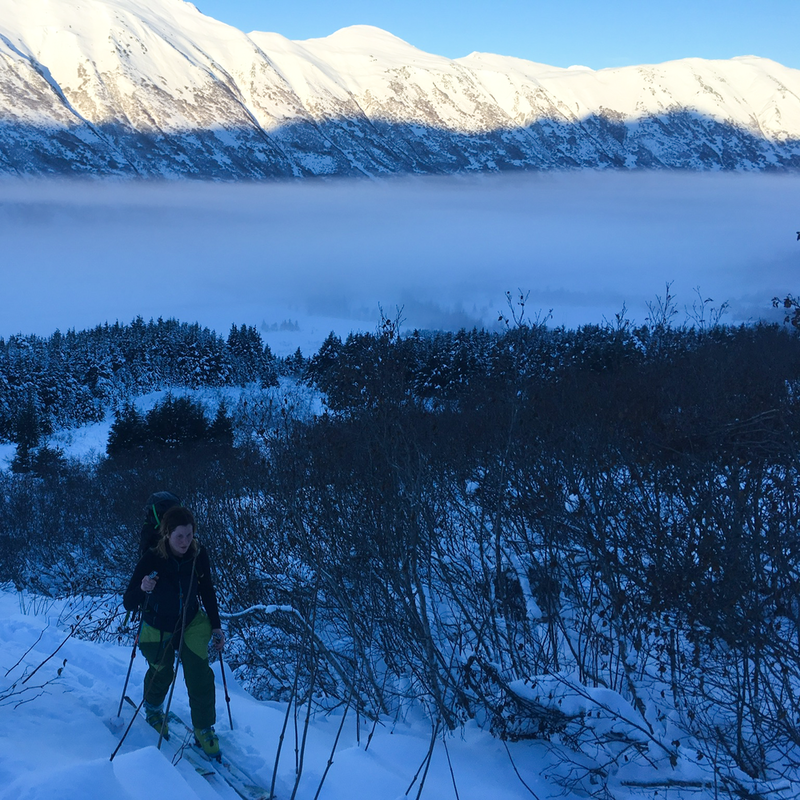 Once there was enough snow this year, we headed to Turnagain Pass so we could ditch the hiking boots and ski from top to bottom. The pass is at 935’ which is helpful when the snow line isn’t coming all the way down to the ocean. So far we have had cold temperatures and light dry snow, which has been a nice change from the last couple of winters. The conditions have been great for skiing, but have complicated our snowpack as far as avalanche danger goes. Because of the current snowpack, we have been on our toes, exploring new, lower angle zones, and pulling off lines when the conditions weren't right. It’s a hard thing to do when the snow is so good, and everyone is chomping to ski steeper and bigger lines, but being cautious has been the theme of the month. So we have just been enjoying being with friends, walking around in the mountains. Taking a good look at a run we were hoping ski, but ultimately decided not to. Finding some good turns in new zones. Early season skiing up here also has the impermeable Alders which grow at lower elevations making approaches and returns quite interesting at times. For those of you who haven't had the pleasure of hiking through Alders, they are considered a tree, but grow in thick bands and are more like huge bushes. They are the nemesis of all Alaskan adventurers. Most people call the activity “Alder bashing”, but I feel like “Alder wrestling” feels a bit more appropriate in my experience. The other day Sam and I decided to ski out the valley from our run instead of skinning back up and skiing out the skin track. We ended up doing quite a bit of bushwhacking that evening, and even resorted to taking our skis off and throwing them through Alder fields while post holing and trying to fight through. Sam says a little Alder bashing is good for me, it builds character and will help me to appreciate all the days that we’re not bushwhacking. I don’t have a good picture of any legit Alder bashing because taking a picture is not the first thing on my mind usually. But here are a few photos to give you an idea of what the Alder fields look like. Also, in the lower elevations, approaches can quickly be complicated by open creek crossings. Nothing more exciting than trying to cross a skinny, ice covered log bridge in ski boots. It can be an easy way to end the day early. Luckily, I’ve stayed out of the water so far this year. In Alaska, flat light is something we struggle with all season. A lot of our skiing is done above tree line, which provides very little depth perception when it is cloudy. On foggy or stormy days, tree skiing is ideal, but we have very little good tree skiing in the area, especially in the early season. If you’re lucky, like me, you have a ski partner willing to drop in first on flat light days. A track down the run provides some reference and contrast and makes it much easier for the next skier. Waiting at the top of a run for a "window." It’s hard to explain the light this time of year to anyone who has never experienced it. The days are short and the angle of the sun is low, making for dramatic lighting all day, and seemingly endless sunrises and sunsets. It’s quite a magical time of year to be up in the mountains. Catching the last of the alpenglow before skiing down to the car. The days are still getting shorter, but the season is on the brink of transitioning from early season to full on winter skiing. The Alders are all starting to lay down, and the mountains are filling in more and more every day. Can’t wait for what December has in store for us up here. Early season can have its difficulties with big storms, short days and almost always skiing above treeline, but when it’s good, it’s unbeatable.